Martinique is part of the Windward Islands, arguably the wildest and most scenic Caribbean islands. The northern part of Martinique is picturesque and boasts impressive natural features; in the central part there is the biggest and quite busy city Fort de France, while the south is a heavenly mix of white beaches and green hills. Martinique is French, so the currency is the euro and the prices are more French than Latin American. I recommend renting a car in order to explore the many beaches and the interior of the island. (For the map and general info about the trip click here: holidays in the Caribbean). Saint Pierre is probably the most fascinating town in Martinique. It lies along long the black beach of a beautiful, wide bay; behind the houses, there are some impressive lush mountains and the Volcano Pelée. Saint Pierre is a mix of quaint houses, shacks, an imposing church and the ruins of some buildings destroyed by the eruption of the Pelée Volcano in 1902. Mount Pelée is the highest and deadliest in Martinica (but at the moment it seems very quiet). Clouds often surround the summit and we didn't manage to see it, but some realiable people asuured that there is a summit indeed. If the weather is good, a nice trek leads to the top from where it's possible to admire a beautiful panorama (we trust them). Both to the nort and to the south of Saint Pierre, along the coast, there are some beaches; Anse Ceron and the other beaches to the north are very wild, black, surrounded by a thick jungle: they are worth the trip for the scenery, evn though swimming is not the best as the sea is often a bit rough. Along the northern coast of Martinique an adventurous path follows the coast up to the picturesque fishing town of Grand Rivière. This peninsula offers some of the best views of Martinique, so please include it in your travel itinerary. White beaches, cultivated fields and green hills make the Presqu'ile de la Caravelle a stunning place. It's all very quiet and it's very unlikely you will have to complain about a crowded beach. The sea is calm, even though not crystal clear; in Tartane there is a shack selling creole chicken with igname, the local potato, which will make you think that maybe we got our potatoes wrong: the igname is delicious! The Caravelle peninsula is on Martinique east coast, the one exposed to the waves of the Atlantic Ocean, but most of its bays are protected from the ocean waves. Le Marin is the best marina of this part of the Caribbean. 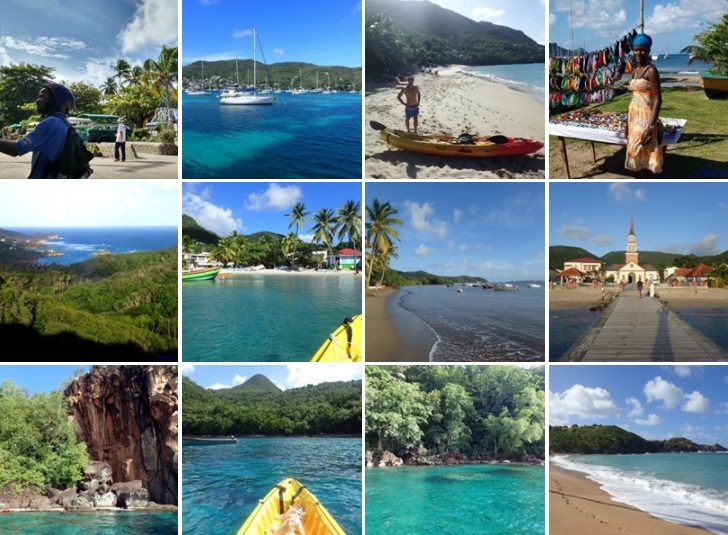 Most of the sailing boats and the charters to Saint Lucia and the Grenadines leave from here. So, if you sailed in those locations, don't be surprised to meet the same persons in the bars of Le Marin and start talking about the huge fish that you (didn't) fish. It's fun. The gulf of Le Marin is long and the water is beautifully coloured of blue and light blue, but for a swim it's better to go to Saint Anne or Anse Figuière. Les Anses d'Arlet are two bays, very pretty and close to each other, in the south west part of Martinique. We got there by sailing boat (they are two beautiful, safe, comfortable places where to anchor and there will be other boats). The two nice little towns in the in two bays are very quiet; so are the wonderful white with palms and colorful houses in the background. Between the bays there is a peninsula boasting red cliffs and green vegetation: an amazing place where to go kayaking. The water is crystal clear and corals and fish make it an ideal place where to snorkel or dive. 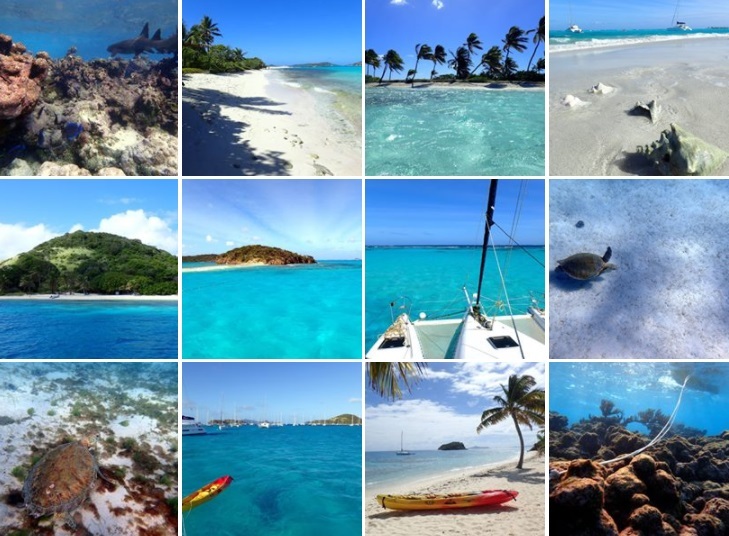 Then go visit the pages with info dedicated to travel itineraries in the Caribbean, to sailing in the Caribbean and to the kayaking trips in these amazing islands. You can also get specific info about Saint Lucia, Saint Vincent, the Grenadines and Tobago Cays.